Every obnoxious act is a cry for help. Obstacles are the things we see when we take our eyes off our goals. You do not pay the price of success, you enjoy the price of success. People don't buy for logical reasons. They buy for emotional reasons. Success is the maximum utilization of the ability that you have. If you can dream it, then you can achieve it. You will get all you want in life if you help enough other people get what they want. A lot of people quit looking for work as soon as they find a job. But we are their only hope for their present and their future. Be helpful. When you see a person without a smile, give him yours. Discipline yourself to do the things you need to do the things you need to do when you need to them, and the day will come when you will be able to do the things you want to do them! If you don't see yourself as a winner, then you cannot perform as a winner. The more you express gratitude for what you have the more you will have to express gratitude for. People who have good relationships at home are more effective in the marketplace. It’s not what happens to you that determines how far you will go in life; it is how you handle what happens to you. There are seldom, if ever, any hopeless situations, but there are many people who lose hope in the face of some situations. If you want to reach a goal, you must "see the reaching" in your own mind before you actually arrive at your goal. You cannot solve a problem until you acknowledge that you have one and accept responsibility for solving it. Too many people spend more time planning how to get the job than on how to become productive and successful in that job. Money isn't the most important thing in life, but it's reasonably close to oxygen on the "gotta have it" scale. If we don't start, it’s certain we can't arrive. Of all the "attitudes" we can acquire, surely the attitude of gratitude is the most important and by far the most life-changing. Little men with little minds and little imaginations go through life in little ruts, smugly resisting all changes which would jar their little worlds. Remember there is plenty of room at the top-but not enough to sit down. 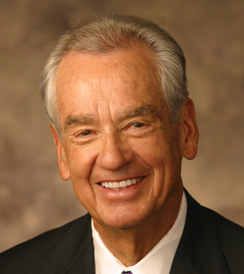 Zig Ziglar is an American author, businessman and speaker. He has published 10 books and other works. He is often a quoted author especially for his motivational quotations. You don't drown by falling in water; you only drown if you stay there. Cavett Rovert, Zig Ziglar quoting his friend Cavett Robert in, See You at the Top. Joyce Brothers, Zig Ziglar has quoted Dr. Brothers many times and he specifically says that this quote is said by Joyce Brothers.